Virginia’s economy has steadily grown over time in spite of expenditures outpacing revenues each year since 2007. However, economic growth within the state is not evenly distributed geographically. We examine Virginia’s revenue and expenditure trends, highlighting the sources of Virginia’s revenue and where it spends money. Then we discuss trends in state economic growth and compare that to recent personal income data by county. Figure 1 shows Virginia’s general spending and revenue trends over the past ten years. According to the Virginia Comprehensive Annual Financial Report (CAFR), after adjusting for inflation, government expenditures have outpaced revenue every single year as seen in Figure 1 below (with the exception of 2006). The red column represents yearly expenditures while the stacked column represents revenues (the lighter shade of blue at the top represents revenue from “Federal Grants and Contracts” and the bottom darker shade of blue represents “Self-Funded Revenue”). During the recession in 2009, expenditures climbed to $40 billion. Expenditures hovered around this amount until 2015 when they reached $41 billion. Then in 2016 expenditures dropped to just under $37 billion, a level last seen in 2006. On the revenue side, the majority of Virginia’s government revenue is self-funded i.e. raised by the state. Self-funded revenue hovered between $24 and $29 billion over the ten year period. However, revenue from federal contracts and grants steadily increased over time. There were two sharp increases in federal contracts and grants: 2008-2009 jumping from $8 to $10 billion and then 2009-2010 jumping from $10 to $13 billion. While there was a drop in federal contracts and grants from 2015-2016, the amount of revenue received from federal contracts and grants has not returned to its pre-2009 levels. What is the state of Virginia spending its revenue on? According to the Virginia CAFR, state spending is separated into six major categories: General Government, Education, Transportation, Resources & Economic Development, Individual & Family Services, and Administration of Justice. The spending amounts from 2006-2016 (adjusted for inflation) are depicted in Figure 2. As shown, the majority of spending over the ten year period was on Individual and Family Services. Prior to 2008, spending on Education closely tracked spending on Individual and Family services, but from 2008 to 2010 spending on the latter increased rapidly while spending on education declined. From 2010 through 2015 spending on Individual & Family Services was just over $15 billion per year. It dropped from 2015 to 2016, but so did spending on education, which maintained the gap between the two categories. During the ten year period, Education spending hovered between $10 and $12 billion until it dropped to $9 billion in 2016. With the exception of Transportation (steadily climbing from 2010-2016), spending on each of the other categories remained below $5 billion per year and was fairly constant over this period. After examining Virginia’s revenue and expenditures in Part 1, we now look at changes in Virginia’s economic growth and personal income at the county level. Data from the Bureau of Economic Analysis (BEA) shows that Virginia’s GDP hovered between $4 and $4.5 billion dollars (after adjusting for inflation), as shown in Figure 3 below. The blue columns depict real GDP (measured on the left vertical axis in billions of chained 2009 dollars) and the red line depicts percent changes in real GDP (measured on the right vertical axis). While Virginia’s GDP increased from 2006-2015, we’ve condensed the scale of the left vertical axis to only cover $3.9-4.35 billion dollars in order to highlight the percent changes in Virginia’s economy. The red line shows that the percent change in real GDP over this period was often quite small—between 0% and 1% in all but two years. Virginia’s GDP rose from 2006-2007 and then immediately fell from 2007-2008 due to the financial crisis. However, the economy experienced larger growth from 2009-2010, growing from roughly $4.07-$4.17 billion, a 2.3% jump. Virginia’s economy held steady at $4.17 billion from 2010 to 2011 and then increased each year up through 2014. Then from 2014-2015, Virginia’s economy experienced another larger spike in growth from $4.24-$4.32 billion, a 2% increase. Virginia’s economy is diverse so it’s not surprising that the robust economic growth that occurred from 2014 to 2015 was not spread evenly across the state. While the BEA is still compiling data on county GDP, we utilized their data on personal income by county to show the intra-state differences. Personal Income is not the equivalent of county-level GDP, the typical measure of economic output, but it can serve as a proxy for the economic conditions of a county. Figure 4 below shows which counties saw the largest and smallest changes in personal income from 2014 to 2015. The red counties are the 10 counties with the smallest changes while the blue counties are the 10 counties with the largest changes. As depicted in Figure 4 above, the counties with the strongest personal income growth are concentrated in the north, the east and areas surrounding Richmond. Loudon County in the north experienced the most personal income growth at 7%. The counties surrounding Richmond experienced at least 5.5% growth. Total personal income in Albemarle County grew by 5.7% while the rest of the counties—Hanover, Charles City, Greene, Louisa, and New Kent—experienced growth between 6.2% and 6.7%. With the exception of Northumberland, the counties in which personal income grew the least were along the western border and in the southern parts of the state. Four of these counties and an independent city were concentrated in the relatively rural Southwest corner of the state—Buchanan, Tazewell, Dickenson, Washington and the independent city of Bristol. In fact, Buchanan County’s personal income contracted by 1.14%. Cross-county differences in personal income growth in Virginia from 2014 to 2015 are consistent with national data as shown below. This map from the BEA shows personal income growth by county (darker colors mean more growth). Nationwide, personal income growth was lower on average in relatively rural counties. Residents of rural counties also have lower incomes and less educational attainment on average. This is not surprising given the strong positive relationship between human capital and economic growth. And during the most recent economic recovery, new business growth was especially weak in counties with less than 100,000 people. In fact, from 2010 to 2014 these counties actually lost businesses on net. Government spending on Individual and Family Services increased during the recession and has yet to return to pre-recession levels. Meanwhile, spending on education declined while spending on transportation slightly increased. This is consistent with other research that has found that state spending on health services, e.g. Medicaid, is crowding out spending in other areas. Economic growth in Virginia was relatively strong from 2014 to 2015 but was not evenly distributed across the state. The counties with the smallest percentage changes in personal income are relatively rural while the counties with the largest gains are more urban. This is consistent with national patterns and other economic data revealing an urban-rural economic gap in and around Virginia. This entry was posted in Balanced Budget, Economic Growth, Tax and Budget and tagged Albemarle County, BEA, Buchanan County, Charles City, economy, education, financial crisis, GDP, incomes, Individual Family Services, Loudon County, Medicaid, New Kent, percent, Personal Income, recession, research, Richmond, spending, Washington on March 6, 2017 by Adam Millsap. Many researchers have found evidence that mobility in the U.S. is declining. More specifically, it doesn’t appear that people move from places with weaker economies to places with stronger economies as consistently as they did in the past. Two sets of figures from a paper by Peter Ganong and Daniel Shoag succinctly show this decline over time. The first, shown below, has log income per capita by state on the x-axis for two different years, 1940 (left) and 1990 (right). On the vertical axis of each graph is the annual population growth rate by state for two periods, 1940 – 1960 (left) and 1990 – 2010 (right). In the 1940 – 1960 period, the graph depicts a strong positive relationship: States with higher per capita incomes in 1940 experienced more population growth over the next 20 years than states with lower per capita incomes. This relationship disappears and actually reverses in the 1990 – 2010 period: States with higher per capita incomes actually grew slower on average. So in general people became less likely to move to states with higher incomes between the middle and end of the 20th century. Other researchers have also found that people are not moving to areas with better economies. This had an effect on income convergence, as shown in the next set of figures. In the 1940 – 1960 period (left), states with higher per capita incomes experienced less income growth than states with lower per capita incomes, as shown by the negative relationship. This negative relationship existed in the 1990 – 2010 period as well, but it was much weaker. We would expect income convergence when workers leave low income states for high income states, since that increases the labor supply in high-income states and pushes down wages. Meanwhile, the labor supply decreases in low-income states which increases wages. Overall, this leads to per capita incomes converging across states. As law professor David Schleicher points out in a recent paper, the current lack of labor mobility can reduce the ability of the federal government to manage the U.S. economy. In the U.S. we have a common currency—every state uses the U.S. dollar. This means that if a state is hit by an economic shock, e.g. low energy prices harm Texas, Alaska and North Dakota but help other states, that state’s currency cannot adjust to cushion the blow. For example, if the UK goes into a recession, the Bank of England can print more money so that the pound will depreciate relative to other currencies, making goods produced in the UK relatively cheap. This will decrease the UK’s imports and increase economic activity and exports, which will help it emerge from the recession. If the U.S. as a whole suffered a negative economic shock, a similar process would take place. However, within a country this adjustment mechanism is unavailable: Texas can’t devalue its dollar relative to Ohio’s dollar. There is no within-country monetary policy that can help particular states or regions. Instead, the movement of capital and labor from weak areas to strong areas is the primary mechanism available for restoring full employment within the U.S. If capital and labor mobility are low it will take longer for the U.S. to recover from area-specific negative economic shocks. State or area-specific economic shocks are more likely in large countries like the U.S. that have very diverse local economies. This makes labor and capital mobility more important in the U.S. than in smaller, less economically diverse countries such as Denmark or Switzerland, since those countries are less susceptible to area-specific economic shocks. There is some consensus about policies that can increase labor mobility. Many people, including former President Barack Obama, my colleagues at the Mercatus Center and others, have pointed out that state occupational licensing makes it harder for workers in licensed professions to move across state borders. There is similar agreement that land-use regulations increase housing prices which makes it harder for people to move to areas with the strongest economies. Reducing occupational licensing and land-use regulations would increase labor mobility, but actually doing these things is not easy. Occupational licensing and land-use regulations are controlled at the state and local level, so currently there is little that the federal government can do. Moreover, as Mr. Schleicher points out in his paper, state and local governments created these regulations for a reason and it’s not clear that they have any incentive to change them. Like all politicians, state and local ones care about being re-elected and that means, at least to some extent, listening to their constituents. These residents usually value stability, so politicians who advocate too strongly for growth may find themselves out of office. Mr. Schleicher also notes that incumbent politicians often prefer a stable, immobile electorate because it means that the voters who elected them in the first place will be there next election cycle. Occupational licensing and land-use regulations make it harder for people to enter thriving local economies, but other policies make it harder to leave areas with poor economies. Nearly 13% of Americans work for state and local governments and 92% of them have a defined-benefit pension plan. Defined-benefit plans have long vesting periods and benefits can be significantly smaller if employees split their career between multiple employers rather than remain at one employer. Thus over 10% of the workforce has a strong retirement-based incentive to stay where they are. Eligibility standards for public benefits and their amounts also vary by state, and this discourages people who receive benefits such as Temporary Assistance for Needy Families (TANF) from moving to states that may have a stronger economy but less benefits. Even when eligibility standards and benefits are similar, the paperwork and time burden of enrolling in a new state can discourage mobility. The federal government subsidizes home ownership as well, and homeownership is correlated with less labor mobility over time. Place-based subsidies to declining cities also artificially support areas that should have less people. As long as state and federal governments subsidize government services in cities like Atlantic City and Detroit people will be less inclined to leave them. People-based subsidies that incentivize people to move to thriving areas are an alternative that is likely better for the taxpayer, the recipient and the country in the long run. Since state and local governments are unlikely to directly address the impediments to labor mobility that they have created, Mr. Schleicher argues for more federal involvement. Some of his suggestions don’t interfere with local control, such as a federal clearinghouse for coordinated occupational-licensing rules across states. This is not a bad idea but I am not sure how effective it would be. Other suggestions are more intrusive and range from complete federal preemption of state and local rules to federal grants that encourage more housing construction or suspension of the mortgage-interest deduction in places that restrict housing construction. Local control is important due to the presence of local knowledge and the beneficial effects that arise from interjurisdictional competition, so I don’t support complete federal preemption of local rules. Economist William Fischel also thinks the mortgage interest deduction is largely responsible for excessive local land-use regulation, so eliminating it altogether or suspending it in places that don’t allow enough new housing seems like a good idea. I also support more people-based subsidies that incentivize moving to areas with better economies and less place-based subsidies. These subsidies could target people living in specific places and the amounts could be based on the economic characteristics of the destination, with larger amounts given to people who are willing to move to areas with the most employment opportunities and/or highest wages. Making it easier for people to retain any state-based government benefits across state lines would also help improve labor mobility. I support reforms that reduce the paperwork and time requirements for transferring benefits or for simply understanding what steps need to be taken to do so. Several policy changes will need to occur before we can expect to see significant changes in labor mobility. There is broad agreement around some of them, such as occupational licensing and land-use regulation reform, but bringing them to fruition will take time. As for the less popular ideas, it will be interesting to see which, if any, are tried. This entry was posted in City Life, Economic Policy, New Research, Regulation, Unemployment and tagged competition, construction, David Schleicher, Detroit, Economist William Fischel, economy, energy, England, growth, incomes, labor, local governments, make, mortgage, President Barack Obama, recession, rules, standards, Texas, UK on January 26, 2017 by Adam Millsap. Lawmakers in California are thinking about increasing the state minimum wage to $15 per hour by 2022. If it occurs it will be the latest in a series of increases in the minimum wage across the country, both at the city and state level. Increases in the minimum wage make it difficult for low-skill workers to find employment since the mandated wage is often higher than the value many of these workers can provide to their employers. Companies won’t stay in business long if they are forced to pay a worker $15 per hour who only produces $12 worth of goods and services per hour. Statewide increases may harm the job prospects of low-skill workers more than citywide increases since they aren’t adjusted to local labor market conditions. “San Francisco and San Jose, both high-wage cities that have benefited from the tech boom, are likely to weather the increase without so much as a ripple. The negative consequences of the minimum wage increase in Los Angeles and San Diego — large cities where wages are lower — are likely to be more pronounced, though they could remain modest on balance. To put some numbers to this idea, I used BLS weekly wage data from Dec. of 2014 to create a ratio for each of California’s counties that consists of the weekly wage of a $15 per hour job (40 x $15 = $600) divided by the average weekly wage of each county. The three counties with the lowest ratio and the three counties with the highest ratio are in the table below, with the ratio depicted as a percentage in the 4th column. The counties with the lowest ratios are San Mateo, Santa Clara, and San Francisco County. These are all high-wage counties located on the coast and contain the cities of San Jose and San Francisco. As an example, a $600 weekly wage is equal to 27.7% of the average weekly wage in San Mateo County. The three counties with the highest ratios are Trinity, Lake, and Mariposa County. These are more rural counties that are located inland. Trinity and Lake are north of San Francisco while Mariposa County is located to the east of San Francisco. In Mariposa County, a $600 weekly wage would be equal to 92.6% of the avg. weekly wage in that county as Dec. 2014. The data shown in the table reveal the vastly different local labor market conditions that exist in California. The price of non-tradeable goods like restaurant meals, haircuts, automotive repair, etc. are largely based on local land and labor costs and the willingness to pay of the local population. For example, a nice restaurant in San Francisco can charge $95 for a steak because the residents of San Francisco have a high willingness to pay for such meals as a result of their high incomes. Selling a luxury product like a high-quality steak also makes it relatively easier to absorb a cost increase that comes from a higher minimum wage; restaurant workers are already making relatively more in wealthier areas and passing along the cost increase in the form of higher prices will have a small effect on sales if consumers of steak aren’t very sensitive to price. But in Mariposa County, where the avg. weekly wage is only $648, a restaurant would have a hard time attracting customers if they charged similar prices. A diner in Mariposa County that sells hamburgers is probably not paying its workers much more than the minimum wage, so an increase to $15 per hour is going to drastically affect the owner’s costs. Additionally, consumers of hamburgers may be more price-sensitive than consumers of steak, making it more difficult to pass along cost increases. Yet despite these differences, both the 5-star steakhouse in San Francisco and the mom-and-pop diner in Mariposa County are going to be bound by the same minimum wage if California passes this law. In the table below I calculate what the minimum wage would have to be in San Mateo, Santa Clara, and San Francisco County to be on par with a $15 minimum in Mariposa County. If the minimum wage was 92.6% of the average wage in San Mateo it would be equal to $50.14. Using the ratio from a more developed but still lower-wage area – Kern County, where Bakersfield is located – the minimum wage would need to be $37.20 in San Mateo. Does anyone really believe that a $50 or $37 minimum wage in San Mateo wouldn’t cause a drastic decline in employment or a large increase in prices in that county? If California’s lawmakers insist on implementing a minimum wage increase they should adjust it so that it doesn’t disproportionately affect workers in poorer, rural areas. But of course this is unlikely to happen; I doubt that the voters of San Mateo, Santa Clara, and San Francisco County will be as accepting of a $37 + minimum wage as they are of a $15 minimum wage that won’t directly affect many of them. A minimum wage of any amount is going to harm some workers by preventing them from getting a job. But a minimum wage that ignores local labor market conditions will cause relatively more damage in poorer areas that are already struggling, and policy makers who ignore this reality are excessively harming the workers in these areas. This entry was posted in Economic Policy, Minimum Wage, Regulation, Unemployment and tagged BLS, California, incomes, Kern County, labor, Los Angeles, make, Mariposa County, San Diego, San Francisco County, San Jose, San Mateo County, Santa Clara, weather on March 30, 2016 by Adam Millsap. Does an income tax make people work less? When asked whether an income tax makes people work more or less, the typical economist gives the sort of answer that would have grated on Truman like a bad music critic. If, however, we change the question slightly and make it more realistic, it’s possible to give a decisive answer to the question. Income taxes do reduce overall labor supply. This is something that economists James Gwartney and Richard Stroup explained in the pages of the American Economic Review some 30 years ago. And last week, the CBO’s much-discussed report on the ACA and labor-force participation illustrated their point nicely. This entry was posted in Taxes and tagged ACA, American Economic Review, budget, CBO, consumption, economy, Edward Prescott, Harry Truman, income tax, incomes, labor, make, Michael Keane Ohanian, Milton Friedman, One Handed View, Ruge Murcia, spending, TANF, tax, Two Handed View on February 13, 2014 by Matt Mitchell. 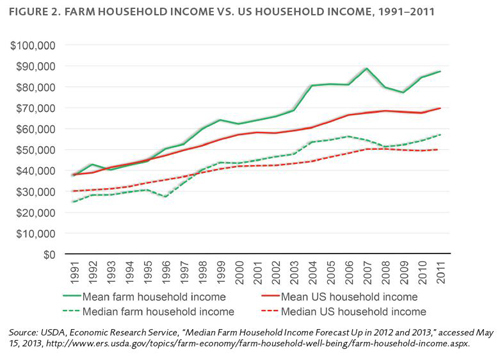 In my last post, I made the case that the farm bill (which has now emerged from conference committee and just passed the House) makes an excellent teaching tool. Many students, of course, are visual learners. 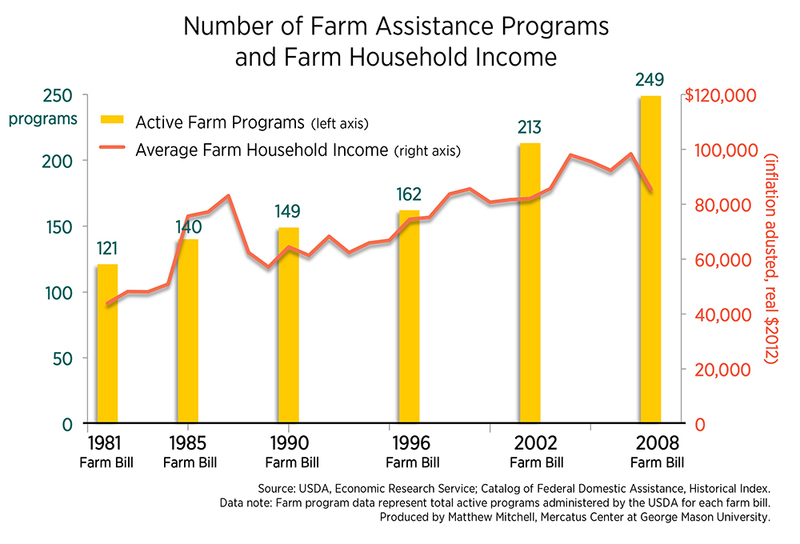 So I thought I might suggest a few farm bill figures. 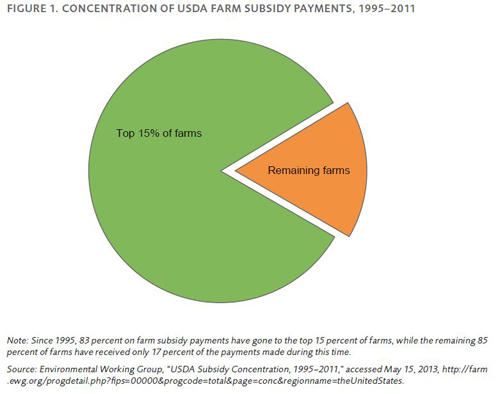 Let’s begin with farm subsidy outlays. 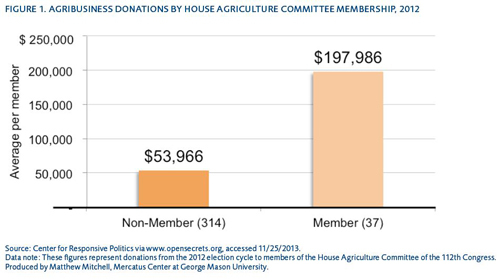 These are the most conspicuous privileges afforded farmers. 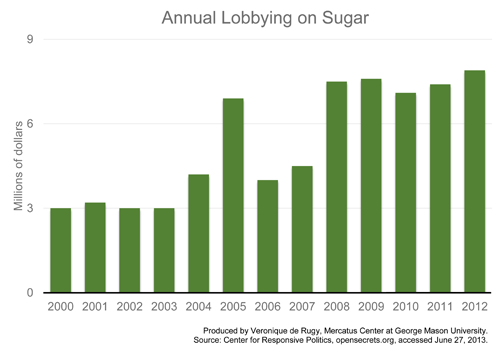 As Veronique de Rugy’s figure below shows, these were around $13 billion per year in the late ‘90s, then surged up to $28 billion in 2000, then settled into annual levels that were about twice their pre-surge levels after that (readers of Robert Higgs will recognize this as a “ratchet” pattern in government growth). The last bar in Vero’s chart shows projected subsidies of about $29 billion in 2014. Another of Vero’s charts, however, suggests that this figure may be optimistic. 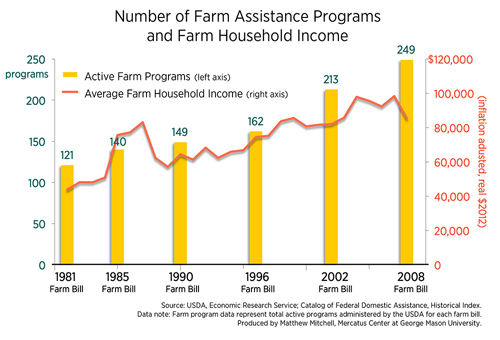 The chart below shows projected and actual farm bill spending for the last couple farm bills (note: these figures include the entire bill not just subsidies, which is why the numbers are so much larger than those in the previous chart). 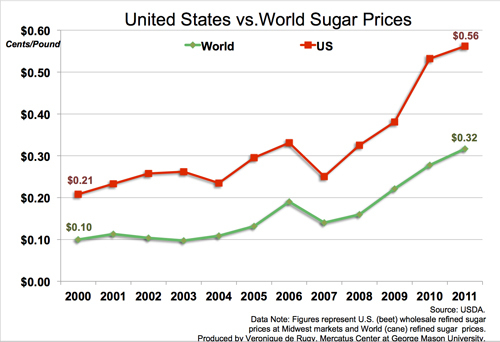 This might seem trivial, but sugar isn’t the only item that is more expensive because of agricultural price supports. The House version of the farm bill imposes artificial price floors on wheat, corn, grain sorghum, barley, oats, long and medium grain rice, soybeans, oilseeds, peanuts, dry peas, lentils, chickpeas, sugar, and dairy products. As I put it in my piece, “Given that these subsidies and price supports distort free market signals and transfer wealth from the relatively poor to the relatively wealthy, one would think they would face bipartisan opposition.” Why, then, do they persist? 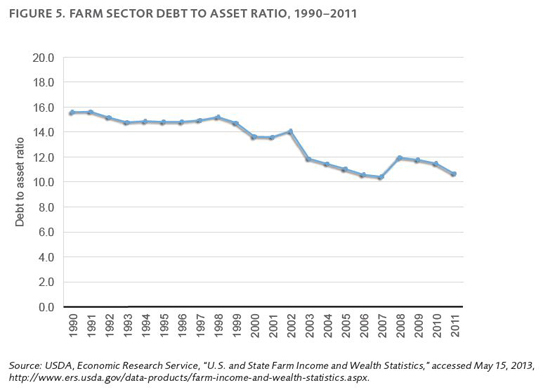 This entry was posted in Government-Granted Privilege and tagged Farm Bill, growth, incomes, percent, Robert Higgs, spending, US, Veronique de Rugy, Vincent Smith, WTO on January 29, 2014 by Matt Mitchell. Does the minimum wage increase unemployment? Ask Willie Lyons. [T]here’s no solid evidence that a higher minimum wage costs jobs, and research shows it raises incomes for low-wage workers and boosts short-term economic growth. Overwhelming empirical evidence has convinced most economists that the minimum wage is a significant cause of unemployment, particularly among the unskilled. [T]he evidence still shows that minimum wages pose a tradeoff of higher wages for some against job losses for others, and that policymakers need to bear this tradeoff in mind when making decisions about increasing the minimum wage. [T]he minimum wage reduces net job growth, primarily through its effect on job creation by expanding establishments. These effects are most pronounced for younger workers and in industries with a higher proportion of low-wage workers. Then, on September 19, 1918, Congress passed a law establishing a District of Columbia Minimum Wage Board and setting a minimum wage for any woman or child working in the District. Though it would have been happy to retain Ms. Lyons at her agreed-upon wage, the Hotel decided that her services were not worth the higher wage and let her go. The wages received by this appellee were the best she was able to obtain for any work she was capable of performing, and the enforcement of the order, she alleges, deprived her of such employment and wages. She further averred that she could not secure any other position at which she could make a living, with as good physical and moral surroundings, and earn as good wages, and that she was desirous of continuing and would continue the employment, but for the order of the board. For a time, the Supreme Court agreed with Ms. Lyons, finding that the minimum wage did, indeed, violate her right to contract. The minimum wage was eliminated and she got her job back. *Legal theorists might well claim that the Immunities and/or Privileges clauses of these amendments would have been more reasonable grounds, but those had long been gutted by the Supreme Court. This entry was posted in Economic Freedom and tagged Ask Willie Lyons, Congress, David Neumark, Due Process, economic growth, growth, Ian Salas, incomes, make, policymakers, research, Steven Landsburg, Supreme Court, Washington, William Wascher, Willie Lyons on December 5, 2013 by Matt Mitchell. Lately, a lot of attention has been given to the fact that millions of Americans are seeing their health insurance plans cancelled as a result of the Patient Protection and Affordable Care Act (aka Obamacare). Some pundits have gone so far as to argue this is a good thing. The cancelled plans, the logic goes, were lower in quality than the plans being offered in the new government health insurance exchanges. Many people will end up paying more for the replacement plans, but since the new plans cover a wider variety of health services, they are better off, right? We made a decision as a society that every car has to have a seat belt or air bags. And so you pass a regulation. And there’s some additional cost, particularly at the start, of increasing the safety and protections, but we make a decision as a society that the costs are outweighed by the benefits of all the lives that are saved. So what we’re saying now is if you’re buying a new car, you got to have a seat belt. If the President’s comparison were appropriate, people would be able to keep their current plans, and might only have to add a new feature or two when they buy a new plan. Instead, people are being dumped from their current coverage and forced into the government run exchanges where they are being forced to buy all kinds of options they don’t want or need. Some might get a subsidy to help with the purchase, but this is still like forcing everyone to buy a Ferrari when all they really want is their trusty old Honda Accord. Sure, if I had to buy a new Ferrari, it might have all kinds of amazing features that my current car lacks. But I would also have a lot less money to spend on other things that I value a lot more, like my monthly gym membership, or taking my girlfriend out to a nice restaurant on occasion. If banning low quality goods and services is so good for consumers, why not extend this logic even further? Why not ban row boats and force people to buy yachts instead? Imagine how much better dressed Americans would be if we banned all of the clothes sold at Target and Walmart and only allowed people to purchase Christian Dior or Armani! The problem with this logic is that quality is what economists call a “normal” good. A normal good is something people demand more of when their income rises. By contrast, an “inferior” good is something we demand more of when our income falls. Think macaroni and cheese dinners or sneakers from Payless, for example. There’s nothing inherently “inferior” about an inferior good. Rather, people with lower incomes often prefer to trade off quality in exchange for a lower price. This is a perfectly rational decision. Since people demand more quality as income rises, banning lower quality products, like catastrophic only health insurance coverage, is actually banning the products that lower income people prefer. And it’s not just the poor who make tradeoffs between price and quality. (For example, I know for a fact that one of my more senior colleagues at the Mercatus Center buys most of his clothes at Walmart!). When prices rise in response to the mandated improvement in quality, the preferences of the poor are ignored and their options limited. As such, each individual must decide for him or herself what the right balance is between quality and price. Once this becomes clear, one has to wonder who a lot of regulations are really designed to serve. For example, the FDA recently announced it will be setting standards for the production of pet food. Are regulations like this designed to cater to the preferences of the poor, who probably opt for the 79 cent can of cat food? Or are they more in line with the preferences of people who already buy organic food for their cats, people who might not mind paying a little extra to ensure that their pet food has met the new standards set by the FDA? Mandating rearview cameras in automobiles is regressive for the same reason. This item was originally found mostly in luxury cars, but, thanks to market innovation, these cameras are rapidly becoming commonplace features in cars, all without government regulation. One of the benefits of the market system is that when a new product is first introduced, the wealthy often pay a lot for it. Over time, the kinks in the product are worked out, and prices fall as the new technology becomes more affordable. Eventually, low income people can afford the product as well, but each consumer must decide for herself when the price has fallen sufficiently to make the purchase worthwhile. Banning low quality items may seem like a noble way to protect consumers, but not when that removes lower-priced options for those consumers who have the fewest resources to spare. Rather than forcing consumers to buy luxury items, regulatory agencies should respect consumer preferences, especially the preferences of the poor. This entry was posted in Health policy, Regulation and tagged Affordable Care Act, FDA, Honda Accord, incomes, innovation, make, Mercatus Center, Obamacare, regressive, regulation, standards on November 19, 2013 by James Broughel. Plans to bring six Wal-Marts to the District of Columbia may fall through over city requirements for the big box store to pay an hourly wage of $12.50, more than a 50-percent increase over the District’s $8.25 minimum wage. Yesterday, the DC City Council voted 8-5 to approve this higher minimum wage, creating a higher wage requirement for stores with over 75,000 square-feet and retailers that make over $1 billion annually. While supporters of higher minimum wages say that they are helping their least well-off constituents, in fact raising the minimum wage for Wal-Mart will hurt the very members of the city’s labor force that council members say they are trying to help. That raising a minimum wage raises unemployment is uncontroversial among most economists. When the employment rate falls with a higher minimum wage, those left without a job will be lowest-skilled workers with the fewest job choices. While a higher minimum wage will benefit a group of employees who keep their jobs and otherwise would have made the lower minimum wage, policymakers must acknowledge the tradeoffs involved in a minimum wage law and that by supporting a minimum wage, they are hurting society’s least well-off members. Furthermore, by discouraging Wal-Mart from opening stores, DC’s council is doing another disservice to residents by reducing availability of low-cost goods. Again, the burden of this policy decision falls hardest on the city’s lowest-income residents. Because those with lower incomes tend to spend a higher percentage of their income on food and other basic goods sold at Walmart, discouraging the company from opening DC locations is a regressive policy. Even for those who don’t choose to shop at Wal-Mart, the retailer’s low prices create pressure for other city stores to reduce their own prices to compete, benefiting an even wider net of consumers. Mayor Vincent Gray has the option to veto the bill, which would require a ninth vote from the Council to overturn. If the DC City Council actually wants to benefit the city’s low-income residents, allowing Wal-Mart to provide jobs and affordable goods would create broader, lasting benefits to the community than a restrictive minimum wage. Requiring large stores to pay a higher minimum wage than other retailers would limit consumer choice, especially for consumers who have few choices, and it would eliminate job opportunities for the least-skilled workers. This entry was posted in City Life, Economic Freedom, Economic Growth, Economic Policy and tagged community, incomes, labor, Large Retailer Accountability Act, make, Mayor Vincent Gray, policymakers, tax, Vincent Orange, vote, Wal Mart on July 12, 2013 by Emily Washington. A few weeks ago, the Department of Transportation (DOT) announced it would delay implementation of a regulation requiring that rearview cameras be installed in new automobiles. The rule was designed to prevent backover accidents by increasing drivers’ fields of vision to include the area behind and underneath vehicles. The DOT said more research was needed before finalizing the regulation, but there is another, perhaps more important reason for delaying the rule. The costs of this rule, and many others like it, weigh most heavily on those with low incomes, while the benefits cater to the preferences of those who are better-off financially. The rearview camera regulation was expected to increase the cost of an automobile by approximately $200. This may not seem like much money, but it means a person buying a new car will have less money on hand to spend on other items that improve quality of life. These items might include things like healthcare or healthier food. Those who already have access to quality healthcare services, or who shop regularly at high end supermarkets like Whole Foods, may prefer to have the risk of a backup accident reduced over the additional $200 spent on a new car. Alternatively, those who don’t have easy access to healthcare or healthy food, may well prefer the $200. A lot of regulation is really about reducing risks. Some risks pose large dangers, like the risk of radiation exposure (or death) if you are within range of a nuclear blast. Some risks pose small dangers, like a mosquito bite. Some risks are very likely, like the risk of stubbing your toe at some point in your lifetime, while other risks are very remote, like the chance that the Earth will be hit by a gigantic asteroid next week. Risks are everywhere and can never be eliminated entirely from life. If we tried to eliminate every risk we face, we’d all live like John Travolta in the movie The Boy in the Plastic Bubble (and of course, he could also be hit by an asteroid!). The question we need to ask ourselves is: how do we manage risks in a way that makes the most sense given limited resources in society? In addition to this important question, we may also want to ask ourselves to what degree distributional effects are important as we consider which risks to mitigate? There are two main ways that society can manage risks. First, we can manage risks we face privately, say by choosing to eat vegetables often or to go to the gym. In this way, a person can reduce the risk of cardiovascular disease, a leading cause of death in the United States, as well as other health problems. We can also choose to manage risks publicly, say through regulation or other government action. For example, the government passes laws requiring everyone to get vaccinated against certain illnesses, and this reduces the risk of getting sick from those around us. Not surprisingly, low income families spend less on private risk mitigation than high income families do. Similarly, those who live in lower income areas tend to face higher mortality risks from a whole host of factors (e.g. accidents, homicide, cancer), when compared to those who live in wealthier neighborhoods. People with higher incomes tend to demand more risk reduction, just as they demand more of other goods or services. Therefore, spending money to reduce very low probability risks, like the risk of being backed over by a car in reverse, is more in line with preferences of the wealthy, since the wealthy will demand more risk reduction of this sort than the poor will. Such a rule may also result in unintended consequences. Just as using seat belts has been shown to lead to people driving faster, relying on a rearview camera when driving in reverse may lead to people being less careful about backing up. For example, someone could be running outside of the camera’s view, and only come into view just as he or she is hit by the car. Relying on cameras entirely may increase the risk of some people getting hit. When the government intervenes and reduces risks for us, it is making a choice for us about which risks are most important, and forcing everyone in society to pay to address these risks. But not all risks are the same. In the case of the rearview camera rule, everyone must pay the extra money for the new device in the car (unless they forgo buying a new car which also carries risks), yet the risk of accident in a backup crash is small relative to other risks. Simply moving out of a low income neighborhood can reduce a whole host of risks that low income families face. By forcing the poor to pay to reduce the likelihood of tiny probability events, DOT is essentially saying poor people shouldn’t have the option of reducing larger risks they face. Instead, the poor should share the burden of reducing risks that are more in line with the preferences of the wealthy, who have likely already paid to reduce the types of risks that low income families still face. Politicians and regulators like to claim that they are saving lives with regulation and just leave it at that. But the reality is often much more complicated with unintended consequences and regressive effects. Regulations have costs and those costs often fall disproportionately on those with the least ability to pay. Regulations also involve tradeoffs that leave some groups better off, while making other groups worse off. When one of the groups made worse off is the poor, we should think very carefully before proceeding with a policy, no matter how well intentioned policymakers may be. The DOT is delaying the rearview camera rule so it can conduct more research on the issue. This is a sensible decision. Everyone wants to reduce the prevalence of backover accidents, but we should be looking for ways to achieve this goal that don’t disadvantage the least well off in society. This entry was posted in Regulation, Transit and Transportation and tagged Department of Transportation, DOT, incomes, John Travolta, policymakers, Rearview Camera, Regressive Effects, research, spending, United States, Whole Foods on July 9, 2013 by James Broughel.